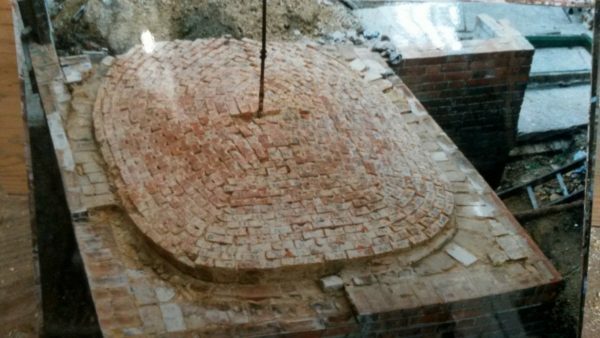 The original idea for the standard dome height of 248mm was that it was based on traditional French bakery ovens of low vault height that make them especially efficient for baking bread using the minimum of fuel. 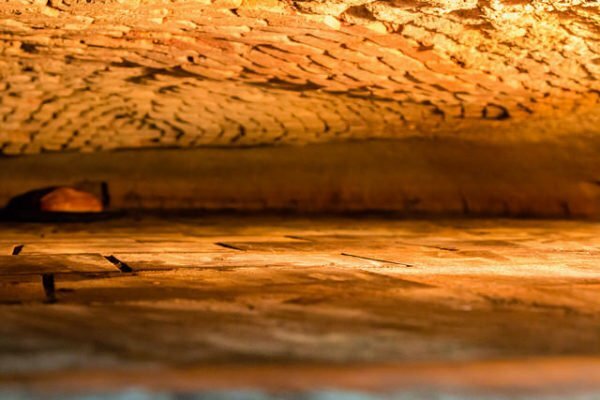 The height has a direct relationship to how fast the mass heats up so the lower the dome the faster the flames can transfer heat to the body of the oven. Compared to most other pizza ovens, Four Grand-Mere’s ovens are noticeably lower but it is this factor that gives them the edge on heat up time and fuel efficiency, saving up to 30% less fuel than other oven makes. 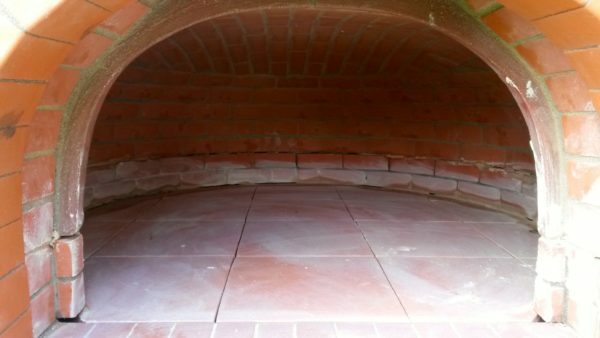 If the standard option is so efficient, why make an oven option with a raised dome height? Interestingly, raising the height by only 75mm ( 3 inches) widens the baking possibilities and allows for cooking large joints of game, goose and roasts and even smoking foods on a rack. Even allowing for that extra 75mm, the raised 323mm oven dome is still lower in height than most Italian ovens of the same diameter. As the diameter increases into the commercial range, the dome still stays low for even baking but it does create an issue with stability. The central apex of the dome needs supporting from falling in. If you cleverly hang the dome from one or more external steel frames, you can achieve large spans without any expense to stability- think pop up tent. 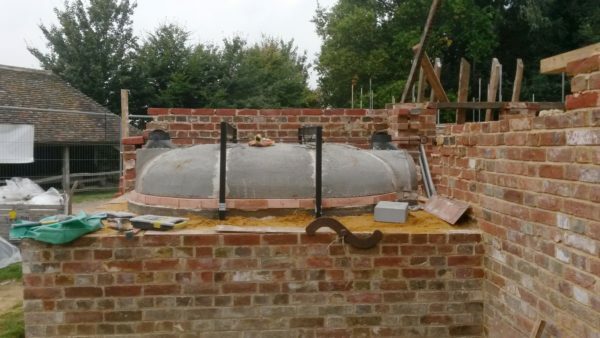 19th C brick bakery oven from Sussex. Note the steel hanger. Historic bread bakery ovens were often very large but low in height, so the builders got round the problem of collapse by adding steel hangers that ran from inside the dome to the timber frame of the roof, a bit like hanging a coat on a coat hanger- a larger more solid structure like a roof truss supporting the weight and force of gravity. 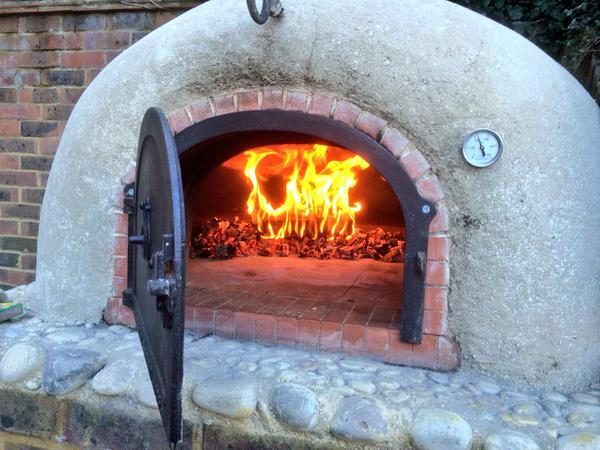 In the UK’s competitive pizza oven marketplace, flexibility is a good USP. You do have to choose between two height options but if you’re a busy pizzeria who also bakes bread before lunch service then a standard oven is all you need. If, like most home oven owners, you want to bake bread, cook pizza and use retained heat for long slow cooking then the raised option is a good idea- it is still fuel efficient, but is available in a large number of sizes. We sell both in equal measure so contact us if you’re not sure, we’re always here to help.